Salon owner Carrie flew down from Aberdeen. She left her home at 3:30am. She got back home after midnight. She had been awake for almost 22 hours, traveled just under 800 miles in a single day for her breakthrough. Dedicated to solving her problems and she did. Well done Carrie. In this email: A Very Special Offer and appointments available in London and Scotland. Dates flexible. What you need to do next. This offer may be out of date by the time you read this blog post. Please check. I’ve created a smart BREXIT breakthrough special for you. How to thrive survive and prosper using your iPhone. Now read this but very carefully. The BREXIT breakthrough special is the price you’d like to pay. In other words, reply with an email that makes me an offer you can afford right now. If I accept the offer … All but one was accepted last time … I’ll get you booked in and we can hammer out any current issues and any BREXIT business fears. You’ll leave with a salon blueprint created, tested and proven to increase your business by 25% in just 25 days. I’ve set aside some flexible times in my diary. In total, there are six slots. Once they have gone they have gone. What kind of businesses use breakthrough? Last offer I had 9 breakthrough clients all with varying businesses and varying problems. Two were start-ups, one had been in business since the 1950s, another for almost 10years and others carrying years. The kind of problems we solved were online issues, like what is working, how do I make it work, does social media work for my business, should I create direct mail, and quite a few other common by hard to solve alone issues. You come to my offices in Hale Manchester. We spend a day hammering out any issues. You leave with your problems dived and a tonne of ideas to work with. One client went away and increased her business by over £30,000 after her breakthrough. Another client sealed the meeting of his life and kick-started a new career. Another created a winning direct mail campaign that delivers a nice unexpected windfall going into the tens of thousands. One more created a system to get more clients fast using just his iPhone. Now if you have fears about BREXIT or simply want to take advantage of this breakthrough special you should grab your place quickly. Simply hit reply and tell me what you can afford. We can agree the date and times that suit you after your offer is accepted. And now is a perfect time to do this. Think about it – it’s summertime, it’s quieter, you can sit and plan and put into place your future plans on avoiding BREXIT pain or simply get more fast track ideas to build your business. The time is the same, the date is the same but everything in your salon has changed. It’s just one year ahead from today. This is a typical Salon Mentor session over at our HQ in Hale Cheshire. Carrie flew from Aberdeen. You have all of your columns filled. Even the slow stylists and the graduates are busy. You have the ability to turn on salon clients and even turn them off when you are completely booked up. Colour sales are high. Retail sales are booming. Premium services are increasing and have never been so good. Even better you now have the ability to turn off your new client tap when you simply can’t take anymore. And it gets even better. Now you have the freedom to stand back, come off your salon floor, take the lead and grow and salon empire rather than just another salon in another city doing the same old thing. Exactly 12-months previously you were struggling. Despite having just one salon or even five salons you just couldn’t get the mix right which meant you were working harder than ever for less than ever. You even thought of giving it all up and doing something totally different. Not anymore. You have the number one salon. You have the biggest salon. You have the best salon. You have the busiest salon and now you are even thinking about opening another whilst spending even less time on the shop floor. I can help you have that and more. One day I got a call from a salon owner in Scotland named Caroline Sanderson. Her salon after 8 years was on the brink of total collapse. She wanted out and needed the advice to get out and make money on the way out. Thankfully after reviewing everything over a week I put into place exactly what she had to do. Caroline applied everything I told her to do and she did it really well. “I can hardly believe the change in not only my business but in ME. 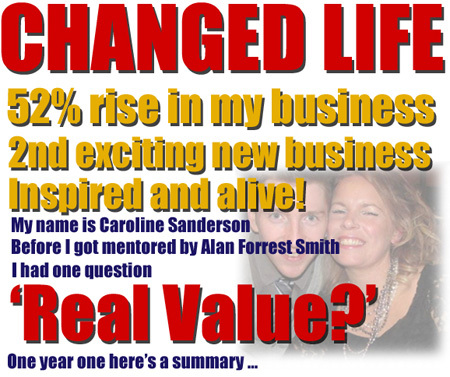 Alan’s strategies and advice with guidance and fun along the way took my business to an 116% rise in one year. It would have been more but I had to make HUGE decisions along the way to create the salon of my dreams which meant having the confidence to make changes and get the people out who I knew deep down were not right for me and my business in the long term. I don’t know how long it would have taken me to make these changes without Alan’s support. With Alan’s support, I made the changes and overall growth of 116% in my salon. I had a client recently that couldn’t get time to consult with new clients. He said it had become a major issue because he simply could not get away from his business. After a breakthrough, he went away with 3 ways he’d never thought about to keep these new enquirers. His Breakthrough was simple yet powerful for him. I had another client that desperately wanted new customers. She had tried everything. I smashed her marketing investment and revealed a very cool way to tap into new customers for almost free. She reported back over 400 new customers over a very short period. Even more recently, a client wanted to know how to do more of his Brock and mortar business online. We did the breakthrough. He can now use his iPhone apps to switch off and on his customers into his business. So if you need a breakthrough why are you waiting? This week everything can change if you really want it to change. All you have to do right now is hit reply and send me your offer. Clients have come to me from New Zealand, Sydney, LA, Singapore, Europe, Namibia and of course good old Wales, Scotland, Ireland and England. Getting here is very easy. By the way, everything can be done over Skype if you are unable to get here. I have dates coming up to London very soon. I also have dates coming up in Scotland. Now all you have to do is hit reply and make me an offer.